Read more about Emergency backup generator? Update: We didn't get the upgraded panel. Thanks for everyone's advice! 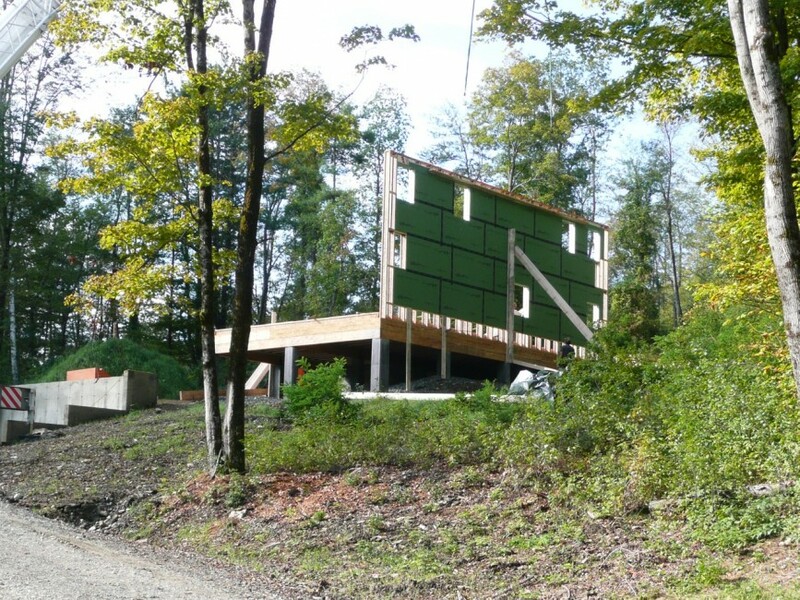 Ted and I need some advice in a hurry: The electrician is about to install our electrical panel, and we need to decide whether to pay an extra $2,350 for a panel that's compatible with a backup generator. We have no immediate plans to install a backup generator, and we hope the grid stays reliable enough that we wouldn't need one. But if we do want a generator one day, it would be a lot cheaper if our panel is ready for it. Note that our house is run entirely on electricity. No wood stove, no gas range. Our water comes from a well, which requires a pump, and our sewer hookup requires a pump as well. The idea of burning propane to power our house gives me the willies, but if there's an extended power failure I'd rather burn propane than abandon ship altogether. One of the many things I like about building websites is how easy it is to change things later on. Want to change some wording or add a new photo? Piece of cake! Need to change something complicated like the page layout? That's a bit more work but 100% doable — change a few settings and template files, and you've got a new layout. Changing a building? Not so easy. You can't just edit the source files and hit "Reload." Nope, changing a building involves crowbars, debris, dumpsters, and a whole lot of work and expense. 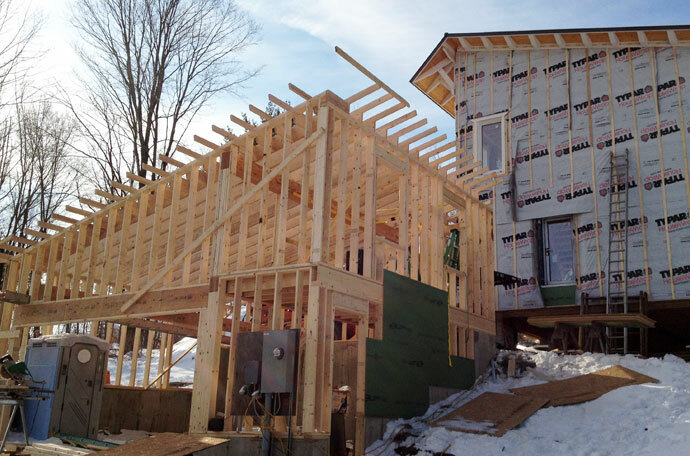 My sole consolation about building a house from scratch is that it's apparently less painful than trying to remodel, so we're making every effort to do things right the first time around. This has meant paying constant attention to detail and making sure we're designing for longevity. The idea of doing things right is so deeply ingrained that we don't even ponder the alternative, and so we often forget how unusual it is. I designed the garage myself, and when it came to sizing the overhangs I simply asked Eli what he recommended and went with that. It didn't occur to me not to have overhangs, or that sizing them properly was unusual enough to attract praise. And yet it is. When people with building experience come visit our house, they're astonished by how well-built it is and how little we've compromised. The most recent was Russ, our new rep from the building supply yard. 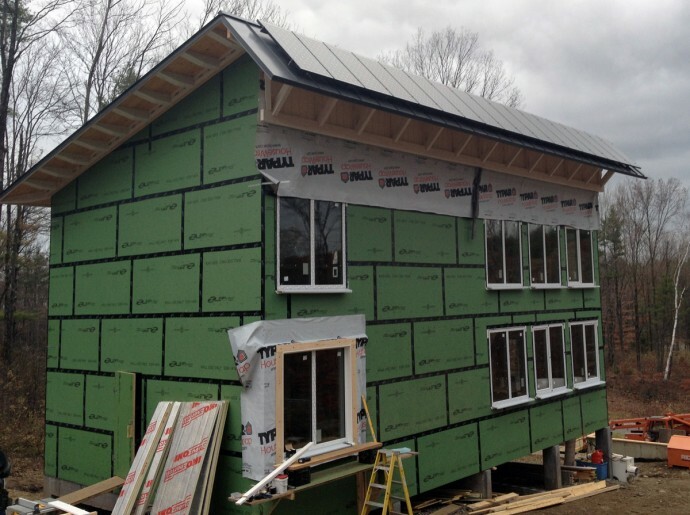 He said he's worked with lots of customers who initially intend to build a super-insulated, passive solar, [insert eco-adjective here] house. But then they see the price for all those green-building features, and they scale it back until they wind up with a house that's only marginally more "green" than a conventional house. Russ told us what a thrill it is to see a house where this hasn't happened. 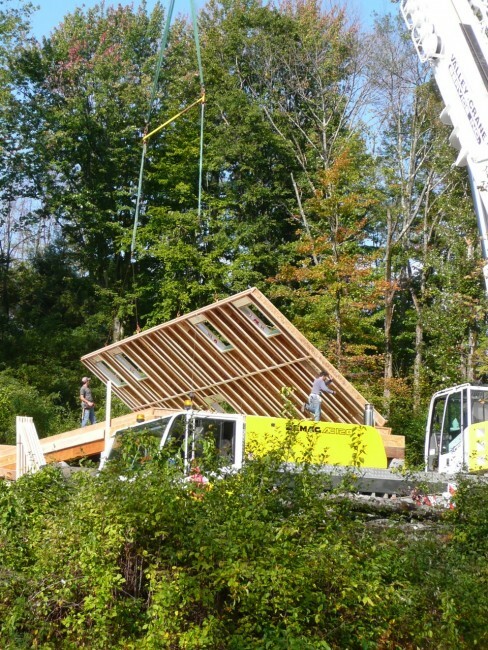 Quite the opposite — our original target was an almost-passive house, and yet here we are building what is now likely to be a certified passivhaus with solar hot water and a 3.96 kW photovoltaic array. I honestly can't think of a single corner we've cut with regard to the building's performance. We've certainly trimmed some other corners. Heck, we lopped about 500 square feet from the original floor plan. The bathrooms are small and simple, the bedrooms have ordinary (not walk-in) closets, the kitchen cabinets are stock rather than custom. But we can't bring ourselves to install anything we'll want to rip out and upgrade in a few years. Hence no formica counters, vinyl floors, or any of the other money-saving standbys. Alas, there is a reason so few people build this way. It's really expensive! I know I've posted about this before, but it's such a big part of our building experience that I can't help repeating myself. Nearly every estimate we receive is like getting the wind knocked out of me — it seems impossible that construction could be this expensive, and yet apparently it is. One of the hardest parts is how often I feel ashamed or that I've somehow failed. 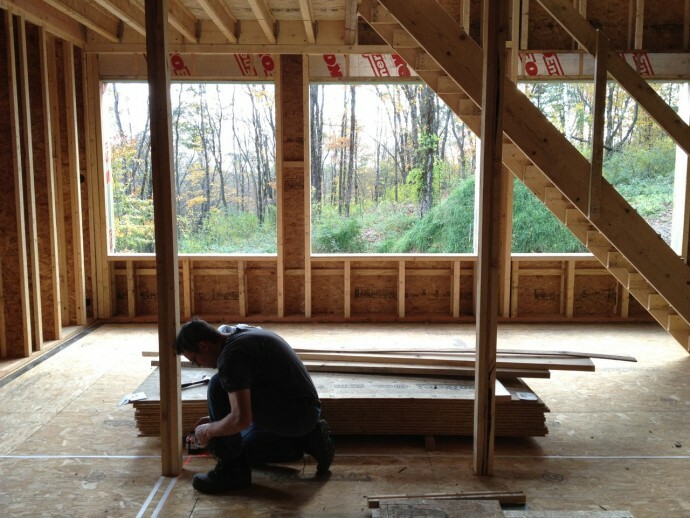 When I started this blog, I really wanted it to describe how we built an almost-passive house for some cute number like $100 or $125 a square foot. But we've sailed past $200 a square foot, and I don't yet know what the final number will be. I'm not looking forward to taking out that mortgage, nor do I relish the possible eventuality of selling the house for less than we put in. Ted suspects that a lot of our costs are because this is a custom home. Yes, all the eco-bling is adding a lot, but not as much as the general costs of building a distinctive home on a challenging site. Perhaps this blog will help illustrate the need for production-scale passivhaus construction. 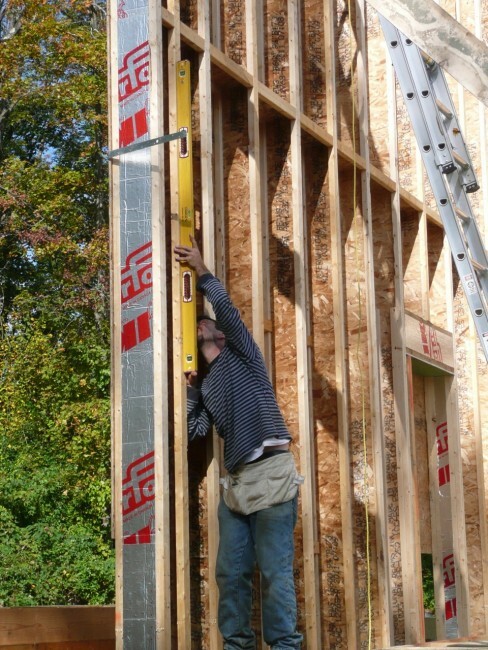 Such construction is common in Europe, and it's beginning to take off in North America. 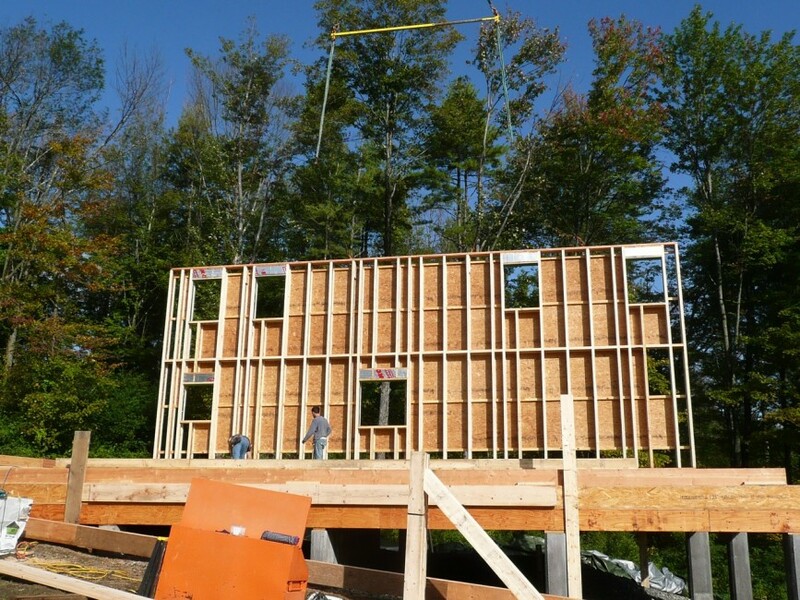 Builders of modular homes are getting in on the game as well, and perhaps very soon it will be possible to get a house like ours much more easily and cheaply than we are. I certainly hope so, because I wouldn't wish this process on anyone, and yet I definitely want more people to have this kind of house. Due to some prior commitments, Eli pulled his crew from our job for much of November and December, and the pace of our construction slowed down accordingly. 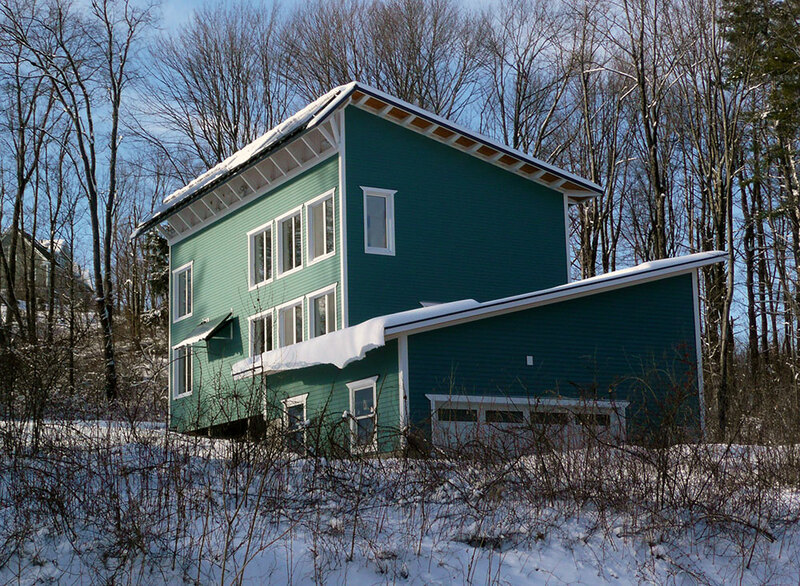 Eli already had a busy year lined up when we first called him last spring, but he couldn't resist the lure of building southern Vermont's first (almost) Passive House. He was able to pull it off thanks to a lot of schedule-shuffling, and once we were weathered in it was our turn to be shuffled. Fortunately, I am such a sporadic blogger that I still have heaps of photos to share. And things are swinging back into high gear, so there should be more rapid and dramatic progress soon. Let the photos commence! Our solar panels went up in November — 3.96 kW of DC goodness. We're not hooked up yet, but that will happen by the end of this month. 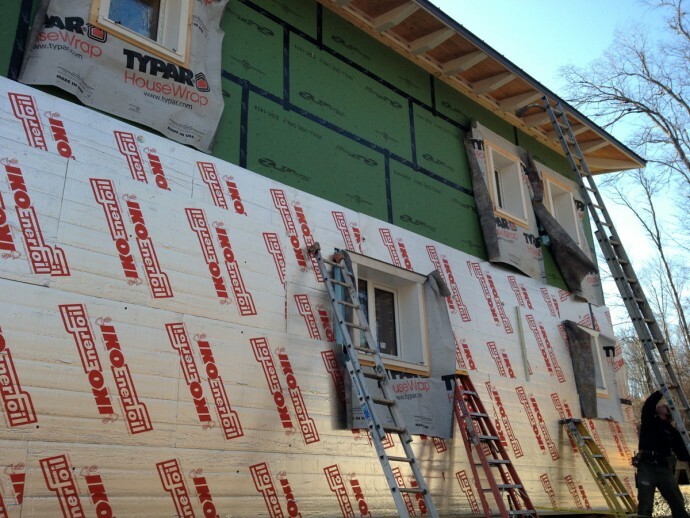 With Eli's team off in Guilford, we hired a pair of building pros to put up our exterior polyiso (rigid foam) insulation , housewrap, and strapping. We probably won't put up the siding until spring, which means our house will have that classy Typar look for several months. 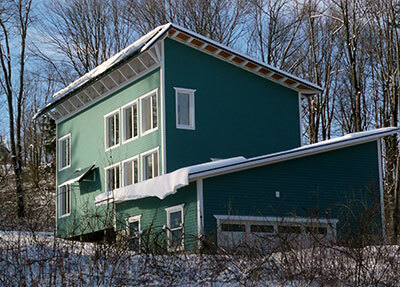 Eli once mused that they ought to sell housewrap printed to look like painted clapboards, but that most Vermonters would then never bother putting up real siding on top of it. I concur. 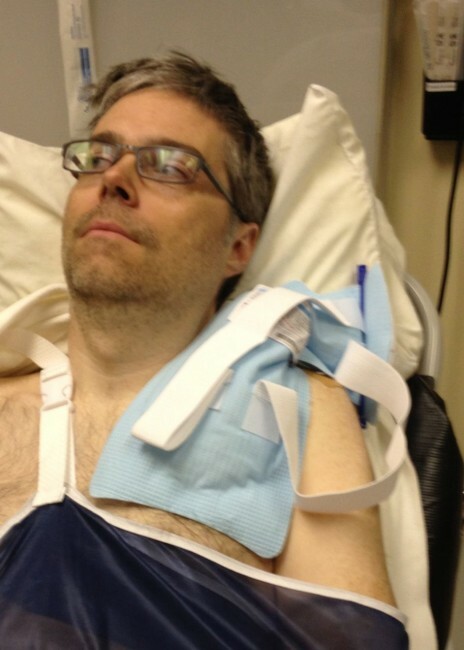 I am pleased to report that Ted's collarbone surgery was a success and that he is recovering nicely. 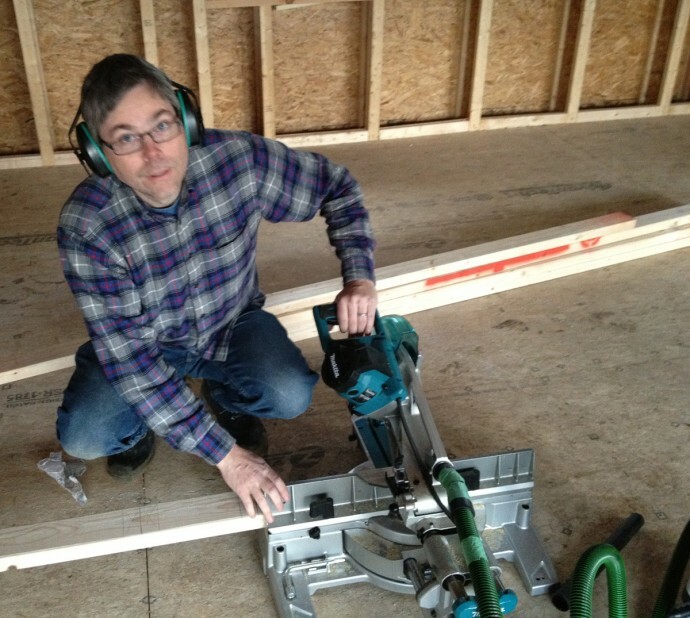 This means that he is back in the DIY saddle, and for the last week we've been busy constructing the two loft spaces. Before sharing the photos, I should explain the two loft spaces. 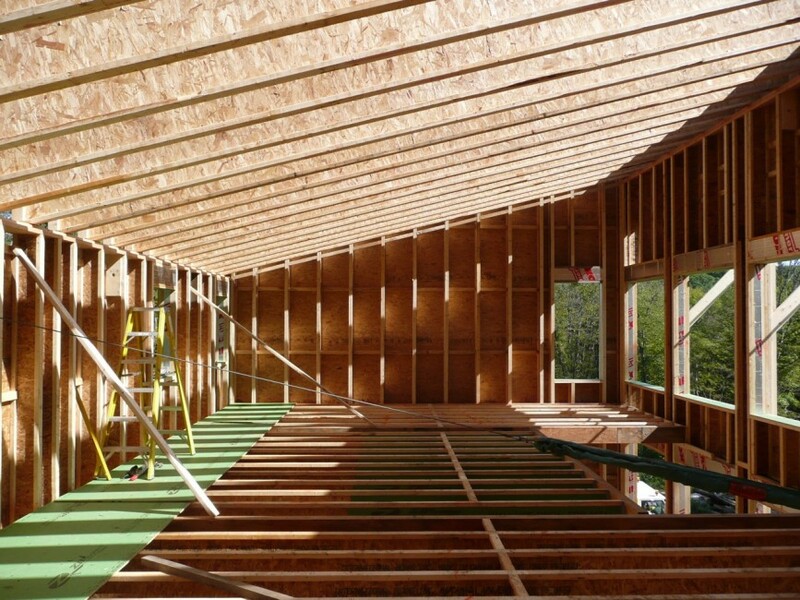 We haven't built any of the upstairs interior walls yet, because we want to install the ceiling drywall all at once, creating a nice uninterrupted vapor-barrier. 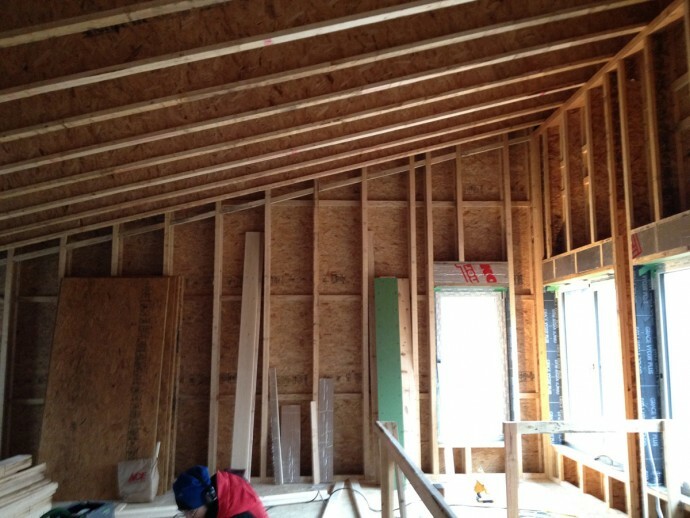 But we can't put up drywall until the roof insulation goes in, and it's hard to do any of that with a ceiling that's 25 feet high in spots (above the staircase and the two-story dining area). Ted and I therefore decided to build the two loft platforms — one is a utility loft over the upstairs office area (it will house the PV inverter and the heat recovery ventilator), and the other is a cozy space we've dubbed the "manatee cave." 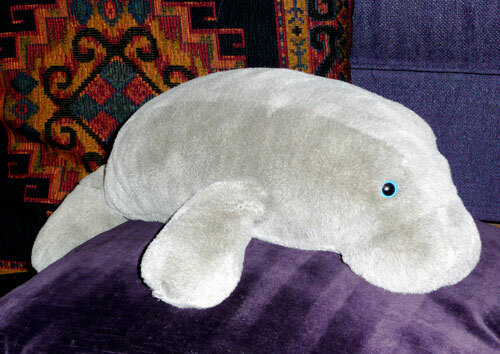 Ted and I are inordinately fond of manatees (especially dwarf land manatees), and we thought that a manatee cave was much more original than a mere man-cave. The manatee cave is on the left, and in the foreground you can see the utility loft. Today we built a temporary platform connecting the two lofts (to facilitate the insulation and drywall work), and tomorrow we plan to build a platform between the utility loft and the west wall, which is where the curved staircase will go (the current staircase is merely temporary). 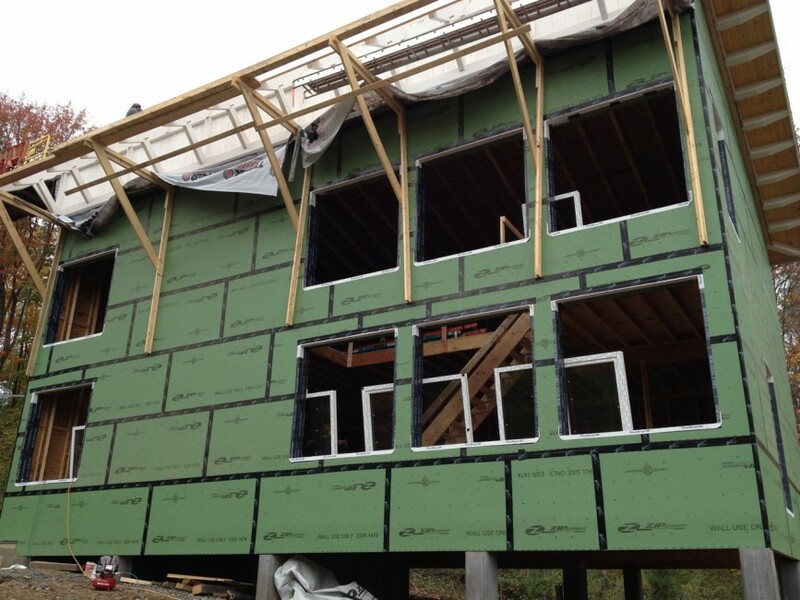 This last photo won't be very exciting to anyone but a building science geek, but it is very exciting to us. It's the readout from our first blower-door test, taken in December. A blower-door test quickly measures how much a house leaks. If Ted and I want to achieve Passivhaus certification, we need to build an insanely tight house (0.6 air exchanges per hour when pressurized to 50 pascals, roughly equivalent to 0.04 air exchanges per hour in a non-pressurized house). We had no intention of running a blower-door test this early, because we haven't begun to seal the obvious leaks. 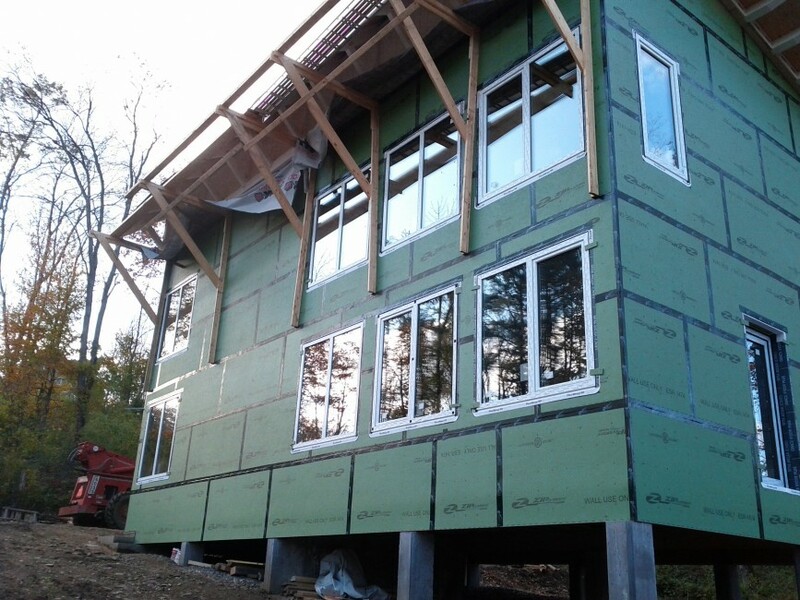 The walls and roof are already very tight, but we can still see daylight at the window corners, and the exterior subfloor is completely absent (we need to finish the rough plumbing and electrical work first). But we wanted to insulate the roof so we could put up the ceiling drywall and build the interior walls, so we arranged a preliminary blower-door test to check for leaks around the roof (much harder to fix once the insulation is in). We taped over some of the gaping leak points to prevent them from wrecking the test altogether, but otherwise we haven't done any post-construction sealing. The readout shows that the pressurized house is leaking at 227 CFM, which in our house converts to 0.65 ACH@50Pa. Which means that before we've even insulated or added the ZIP-sheathing subfloor, we are within spitting distance of the rigorous Passivhaus requirement. The test was run by Bill Hulstrunk of National Fiber, and he said that of the thousands of houses he's tested, this was the tightest house he'd ever seen. I am too superstitious to remove the "Almost" from the name of this website, but things are looking good in that department! 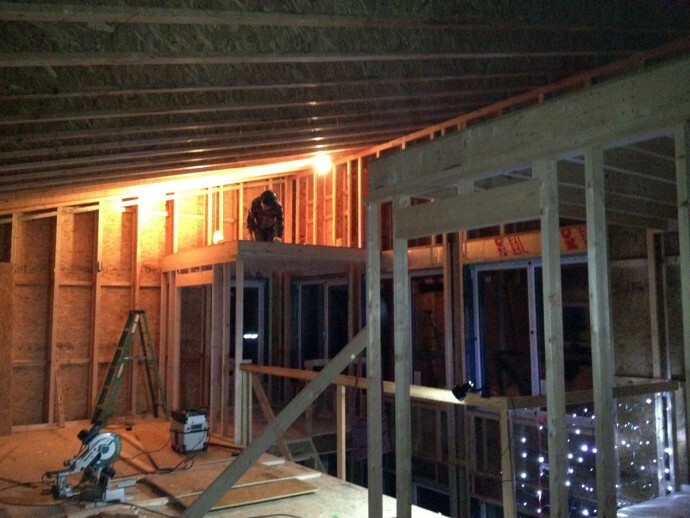 Work is now kicking back into high gear — in the near future we hope to get roof insulation, ceiling drywall, rough electrical wiring, and a garage. Our winter has been largely snow-free, a fortunate circumstance I attribute to Ted's and my purchase of a heavy-duty snowblower and season lift tickets at Stratton and Okemo. So I hope to have lots of thrilling new photos soon. In retrospect it was a piece of cake, like coloring within the lines of a coloring book. Picking out a few fixtures for a house that somebody else had designed and was building? No problem! By contrast, I've been actively planning our current house for two years, and only now am I picking out fixtures. 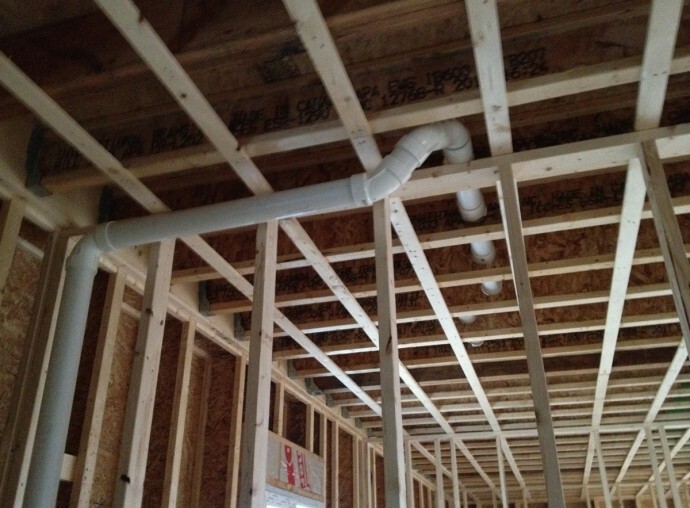 After overseeing a foundation and envelope, e-combing North America and Europe for windows, sourcing commercial-depth roof joists, and frantically ordering expanding foam tape and air-sealing gaskets, the task of picking out faucets and tiles is but a frivolous afterthought. And yet I wish I'd been frivolous enough to start doing this sooner. If only I'd whiled away the hours last winter bookmarking light fixtures and plugging them into my SketchUp models! Because now I'm frantically scouring the web for ideas, and I'm also running around to plumbing and appliance showrooms trying to get quotes in a hurry so my subcontractors can get to work. My insane level of attention to detail is both a blessing and a curse. It means I have a good eye for design and user interface, and I think carefully about how everything will come together. But it also means I can't just relax and pick things haphazardly, because living with a bad choice will positively drive me nuts. I haphazardly selected our ceramic floor tiles in Tucson, not noticing until after they were installed in every room of the house that they had a rustic-looking dirt pattern baked right in. A friend helpfully pointed out that you wouldn't be able to tell when the floors were dirty, but I replied that you also couldn't tell when they were clean. Obviously I can't anticipate everything, and I'll have to be philosophical about whatever bad choices we make, but I know a lot of eyes are on this project and I don't want to let down the team. The biggest challenge is probably the lighting. So many different fixtures and setups to choose! I see why a lot of builders just give up and litter the ceiling with recessed cans, but we are scrupulously following Martin Holladay's Ten Rules of Lighting and avoiding recessed cans like the plague. As Holladay points out, it's better to illuminate the ceiling than the floor. With a white-painted ceiling, the light will bounce off it nicely in a way that mimics the natural world (bright sky, darker ground). Recessed cans, however, cast weird shadows and call undue attention to the floor (including those pre-dirted ceramic tiles). T5 tubes are have a much smaller diameter than the old schoolroom fluorescents we're all used to: 5/8" as opposed to 1-1/2". They produce an impressive 100 lumens per watt, which means lots of bang for your electricity buck. And this fixture embraces the stark look of the tube, meaning that all the light is illuminating your house and not the inside of a shade. We'll probably use a lot of T5 fixtures, but we'd also like to use LEDs where we can afford to. One way to do this, ironically, is to buy Edison-style fixtures and then screw in LED bulbs. Today I boldly (foolishly?) ordered some sale-priced pendants that take a standard candelabra bulb, which I can then turn into LED fixtures by installing LED replacement bulbs. I'll let you know how that works out. I've put Ted in charge of researching LED strip lighting, which we plan to use liberally. For example, we want a "late-night glass of water" switch in the kitchen that will turn on red lights rather than white ones (to keep the sleepy wanderer's pupils from contracting), but I'm concerned that red lights in the kitchen might convey the wrong message. We're also choosing appliances, which will likely include a relatively inexpensive top-freezer refrigerator, a mid-tier induction cooktop, and some crazy fancy dishwasher (Ted imprinted on an ASKO from Sweden the other day). Indeed, if anything prevents us from reaching net-zero performance, it will probably be our deep love of automatic dishwashing. They make energy-efficient dishwashers in America, but Ted is quite opinionated about dishwasher rack configurations and so far only likes the ASKO. I'll let him win this round, though, because if Ted doesn't like our dishwasher he might feel less inclined to load it (which he is generally quite good about doing.) I confess to being conniving in this one small way. That is really just the tip of the shopping iceberg, and writing this post has been a nice break from the endless online browsing. In other news, we got about 18" of snow last night (yes, in October). The roof installation isn't yet complete, but the unfinished parts are tarped and/or tri-flexed and should therefore be unharmed. 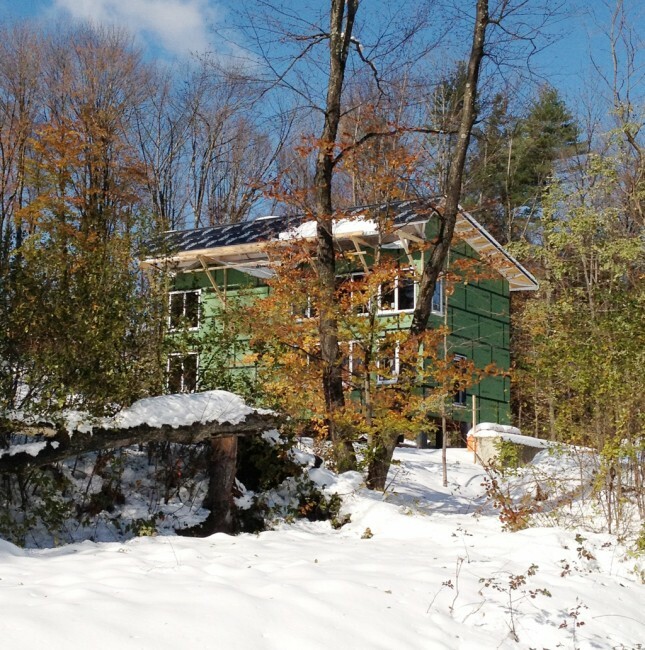 Ted and I drove up this morning and saw that the solar awning to the south had already shed most of its snow (yay!) and that the north drip-edge was working nicely. We're hoping the snow will melt quickly and that work can resume without delay. It's been a busy couple of weeks on our building site, and I've been fearfully remiss about blogging. I will now right that wrong. 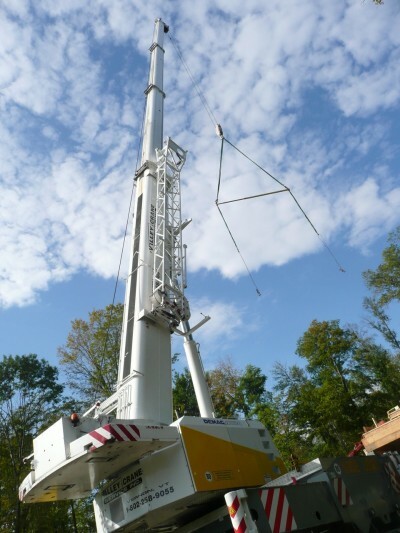 After weeks and weeks of downright biblical rain, we had great weather on October 5 and 6 for the crane. It was no ordinary crane -- due to a last-minute switcheroo from the equipment company we wound up with a 165-ton crane, practically the largest in New England. 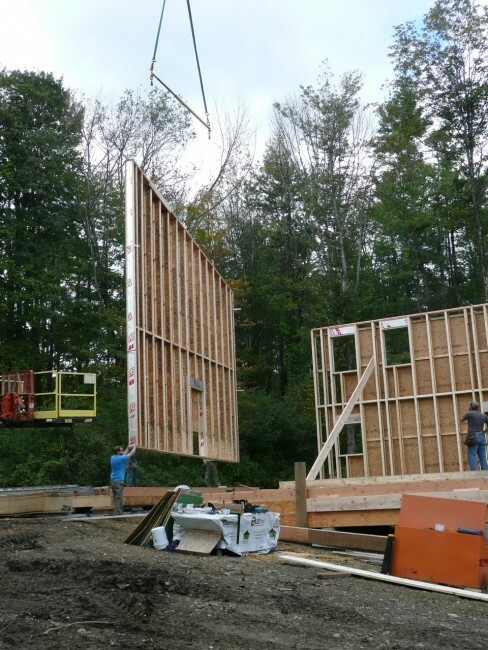 This was a fortunate switcheroo, because our building site is awkwardly shaped and the pre-constructed walls would have been hard to lift and place with an ordinary little crane. 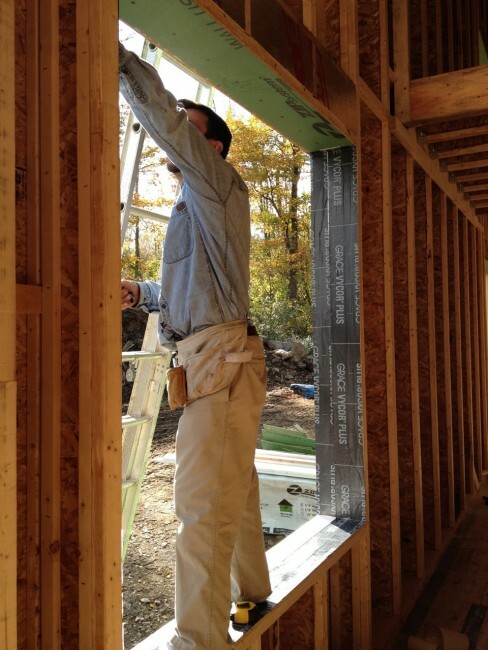 Nothing warms a homeowner's heart like seeing a crew member wield a level. 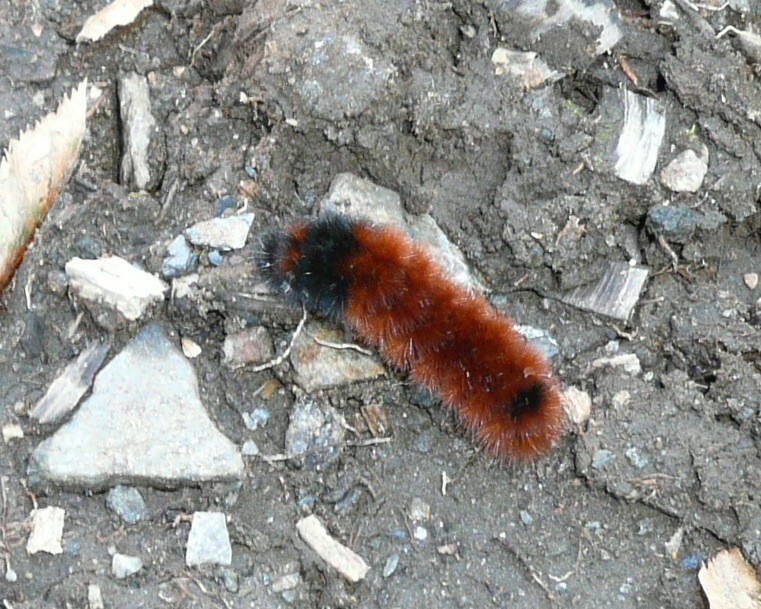 A woolly bear caterpillar turned up, prompting a conversation with Milt the crane operator about what kind of winter its coloring foretells (answer: no clue). 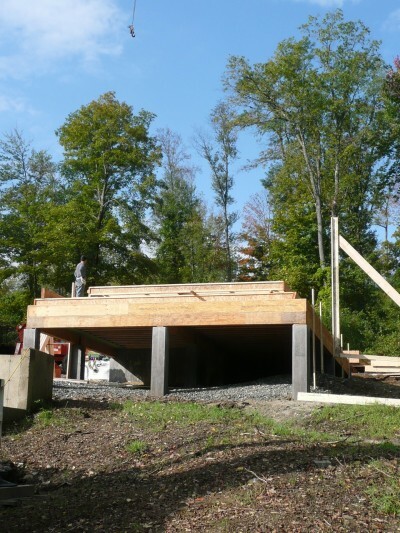 The following day they used the crane to place the 24"-deep roof joists, shown here from the second floor. They also placed the timber-frame awning, which will hold up the solar panels. It was definitely two dramatically productive days! Eli's crew has been busy on-site ever since then, but the time for Ted's and my DIY phase had arrived. 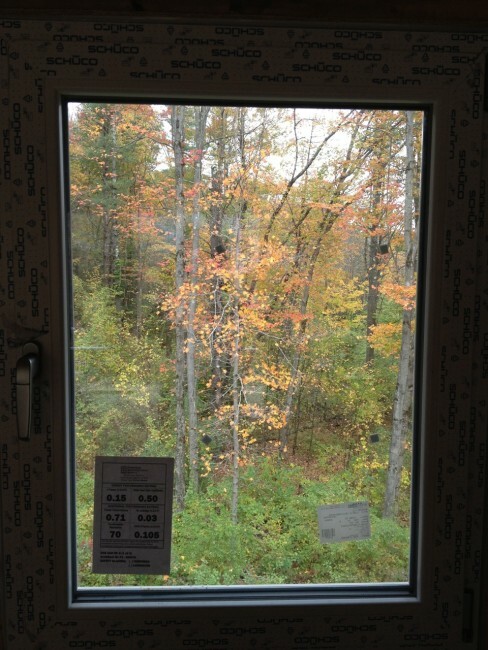 Last weekend Ted used a laser level to start laying out the interior walls (note autumn foliage in the background). He's scheduled for surgery in a few days, and he'll be unable to swing a hammer for a solid six weeks. But work continued, culminating yesterday with the arrival of our windows. Eli and I worked all day Tuesday preparing the rough openings with Vycor, flex-wrap, and flashing tape. Eli overhead Patrik and Tomas from European Architectural Supply say that we had the best-prepared rough openings they'd ever seen. They even took photos, presumably to shame their other clients. So at last we have a weathered-in house! No insulation yet, but it's already warmer and more comfortable than our drafty apartment.